In 2009 my parents purchased a near-dream house. The surroundings, size, and location were perfect—the house overlooks a meadow and pond to the west and foothills to the west. Unfortunately, the house failed to take advantage of its setting. Its outdated interior was chopped-up into small, stuffy rooms cut off from the outside by tiny windows. And despite being situated on a large plot, the deck on the east was always too hot to be usable. My goal was to provide my parents with a calm, healthy environment by increasing the connection between the indoors and the outdoors. To make this happen I proposed adding new decks shaded with new roof extensions to the east and west sides of the house, opening those walls up with larger windows, and gutting and refinishing the main living spaces. The result is bright and airy living space that flows into the outdoors. The view from the new front deck. Previously, the entry was dark and stuffed up with too many walls and an unusually-placed closet. 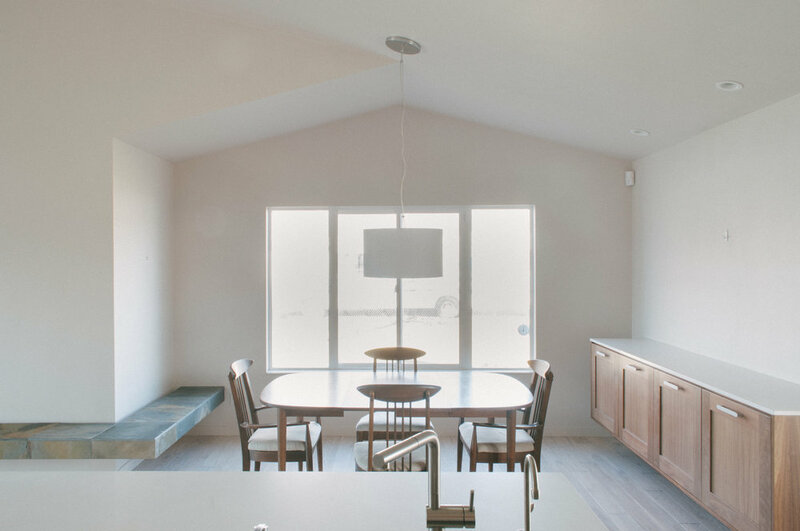 Now, the entry opens directly into the main living space and receives light from two walls. Opposite the entry is a fireplace which serves as the focal point of the main living space. In front of the fireplace is a bench which is hung off the wall and floats off the floor. It's wrapped in grey slate. The kitchen was previously taking up room in the middle of the greater space, cutting the small rooms off from each other. Moving it to the opposite wall, off to the side, allowed all the spaces to open up to each other. My mom is a longtime collector of beach glass. I used this translucent glass tile for the backsplash because it shares the smooth look and feel of the glass bits she's gathered over the years. Like to talk about an old house that needs some love?